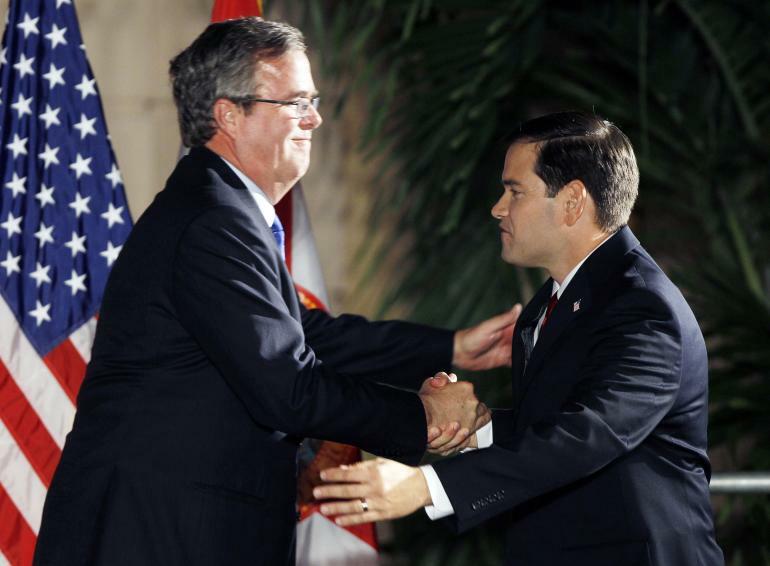 Half of Floridians think Marco Rubio and Jeb Bush should quit the presidential race. Almost 50 percent of Florida voters say that former Gov. Jeb Bush and Sen. Marco Rubio should end their respective bids for the Republican presidential nomination, according to a new poll. A survey from the left-leaning Public Policy Polling (PPP) finds that 47 percent of voters in the Sunshine State say Bush should drop out, while 40 percent say he should stick with it. Forty-eight percent also say Rubio should drop out, while 42 percent say the senator, who has opted to run for president instead of seeking a second term in the Senate, should not drop out of the race. A similar survey from the polling outfit released last week found that 78 percent of Republicans in South Carolina thought Sen. Lindsey Graham should end his 2016 GOP bid. Bush and Rubio are thought to be top contenders for the GOP nomination, but are polling in single digits nationally behind billionaire businessman Donald Trump and retired neurosurgeon Ben Carson. In the latest poll of Florida, which holds its primaries in mid-March, Trump is supported by 28 percent of GOP primary voters, followed by Carson (17 percent), Bush (13 percent) and Rubio (10 percent).